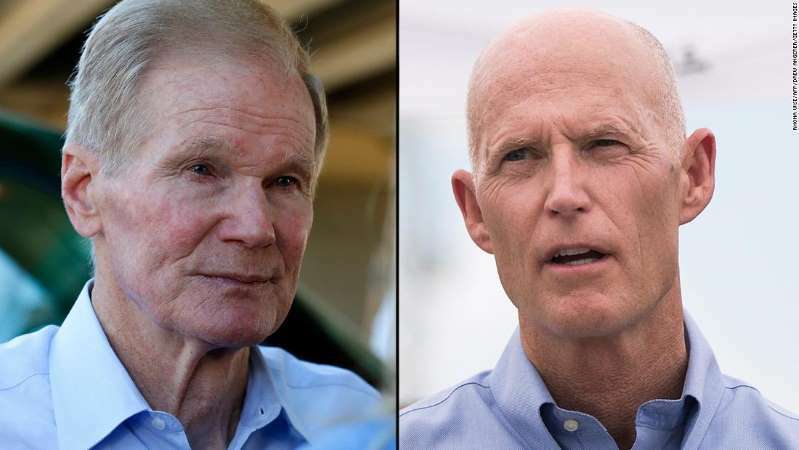 Florida candidates in hotly contested races for governor and US Senate are adjusting their campaign plans as Tropical Storm Michael is poised to slam the state's Panhandle. Florida Gov. Rick Scott, the Republican nominee for Senate, declared a state of emergency Sunday and activated 500 Florida National Guard troops in preparation for the storm. Scott will be leaving the campaign trail for the "next few days," a campaign spokesperson told CNN. Sen. Bill Nelson, the Democratic nominee, will be meeting with emergency management officials in the Panhandle tomorrow "to make sure local officials have everything they need," a campaign spokesperson told CNN. The forecast indicates the tropical storm could strengthen into a hurricane by early Wednesday and will likely target the Panhandle later that day, according to CNN meteorologist Gene Norman. Meanwhile, the US Senate and gubernatorial elections in Florida are just weeks away, on November 6. Democratic gubernatorial nominee Andrew Gillum announced Sunday he will be leaving the campaign trail briefly to address storm preparations. The forecast projects Tallahassee, where Gillum is mayor, will be directly hit. Gillum is in a close race against former Rep. Ron DeSantis, who received the high-profile backing of President Donald Trump and won the Republican primary. DeSantis' campaign did not immediately return CNN's request for comment.